Anyway, if you are lucky enough to be getting to Edinburgh (or Glasgow) this year, or both, I'd really recommend this little book. Unlike a lot of shopping guidebooks I've seen, this one really concentrates on unique shops, and shops all across the consumer spectrum: there's the obvious wool and whiskey and so on, but also chocolates, bagpipery supplies, and vintage clothing. The book includes so many luscious full-color photographs that I want to go to Scotland now just for the light in the pictures! Ah, Scotland. One of my favorite places to visit. Beautiful landscapes, music, tradition, art, culture. If I weren’t Mediterranean, I’d be a Celt! Sigh. 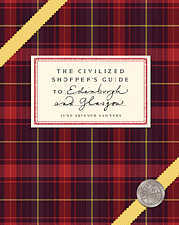 I SO wish I had a reason to purchase this guidebook … I adore Edinburgh. Oh, I’d love to go, too. Too bad I have no money and my passport expired. And school doesn’t let out until mid-June so even if I had the cash I’d have to miss Whisky Month.Part of my family still owns and works the farm that belonged to our original immigrant Scot, who came here back in the colonial days. If I were wealthy, it would be fun to be able to take my dear Aunt from that branch of the family to Scotland, but I’m sure she wouldn’t let me spend the money! Trust me, they’re quite welcoming! (I went and got my Masters in Scotland but am from the US).Looking through the index they’ve got most of what I would expect for Edinburgh(although Plaisir du Chocolate is closed). Nothing beats just wandering oneself, however, especially maybe further afield than the writers went. Scotland, especially Edinburgh, is my favorite place in the world to visit. I remember the first time I entered the city, it felt like I was travelling back in time. It’s such a magical place. The one thing I would love to experience is Christmas in Scotland…sigh. Glamour Girl, you may not be a Scot, but you can ABSOLUTELY be a Mediterranean Celt! Celts are fairly widespread – they aren’t limited to the Seven Nations. We have a neighbor who is Scottish, with a full brogue. We petsit her dog when she’s gone. He’s a Westie and, as she says “a wee dumbdumb.” If you don’t call him with a little Brogue in your voice, he doesn’t understand you. She’s going to Scotland next month — wish I was going with her! Meantime we’ll be watching Colin aka Cullen (insert brogue) instead. I was in Scotland once for several weeks, and in Edinburgh for three days of it. It had been raining for at least a few days. The stones that the old Edinburgh buildings were made of were glowing dark pink because they were very wet. Gorgeous.We took in some theatre at the Fringe Festival. Unforgettable stuff. Wonderful.We took the train to Inverness and pitched our tent at the Findhorn campground. It was cold and it snowed lightly onto our tent one night and it was July. We wore long underwear and clutched our sleeping bags tightly around us and shivered and it was fun.We took our bikes by train and ferry to the Isle of Skye and cycled up and down half of it. We camped there, too. It was so unbelievably gorgeous. I’ll never forget it. I can remember the mountains and wind and stinging rain on my face and see the huge rainbows of Skye as clearly as though I’m there again.What are you waiting for, Erin? I just read _The Vanishing Act of Esme Lennox_. I can’t remember the author, but a very readable (and, in some ways disturbing book), but most of the action takes place in the 1930s. The narrator is the proprietor of a vintage dress shop, but that is not what the book is about. Anyway, lots of Scotland. Once I flew from Los Angeles to Scotland…for the weekend…for a birthday party,It was glorious. Oh how I would love to go back to Edinburgh! I only got 2(ish) days there during my 2 months in England last summer. I had an appointment at the National Collections of Scotland to view a selection of 18th century garments (what the summer was spent doing, mostly at the Museum of London).It was August, about 14C and very rainy- but GORGEOUS, GORGEOUS, GORGEOUS.I didn’t get too far afield past the Royal Mile (LOVE the Closes! ), some of the New City, some of the Old City, and a water logged Leith (where the collection was housed). It was so not enough time, I need more – MORE! http://www.vam.ac.uk/vastatic/microsites/1486_couture/create.phpNot Scotland related – but have you seen this dress? Free pattern too! A couple of years ago I stayed in Edinburgh for three months, as part of a student exchange program. I loved it, and have wanted to go back there and see more of Scotland ever since. Sadly, I haven’t been able to do that yet… The book looks good, and it does list ‘the fudge house’ in Edinburgh (which I guess is the same shop I know as ‘the fudge kitchen’, on the Royal Mile). Nobody with a sweet tooth should miss that: they make fudge in all kinds of flavours right in front of you in the shop, delicious! And don’t miss the ‘Armstrong’s’ vintage stores: the one on the Grassmarket is like a cave of treasure: wierd second hand stuff, almost priceless vintage pieces and everything in between all brought together in maze-like old building, watched over by friendly staff. Love Scotland – particularly Glasgow. My brother lived there for six years and I got to visit a couple times. Fantastic country. I have been thinking of going this year for the Homecoming as there are a lot of great events planned. The Homecoming is clearly an attempt to boost tourism – and how close you are to the clan doesn’t really matter. Thanks for the link to the book – will definately have to get it!